Mumbai: Mergers and acquisitions (M&A) worth $8.2 billion were closed in India during the first three months of 2016, according to MergerMarket, a global deal-tracking platform. The amount is the highest since 2012 and an increase of 5.2% as compared to the same period last year. The construction sector was the most active in terms of deal-making and accounted for 43% of the value of all the deals closed. Seven transactions worth $3.5 billion were announced in the first quarter compared to two deals worth $266 million in the same period last year. 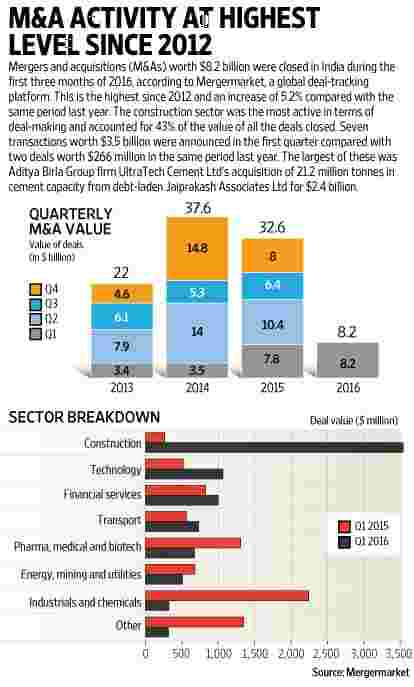 The largest of these was Aditya Birla Group firm UltraTech Cement Ltd’s acquisition of 21.2 million tonnes in cement capacity from debt-laden Jaiprakash Associates Ltd for $2.4 billion. Birla Corp Ltd’s $706 million acquisition of Reliance Cements assets was the other big deal in this segment during the quarter. Transportation was another sector which attracted increased interest with 11 announcements worth $732 million during the first three months. The logistics sub-sector saw five deals compared to none in the corresponding period last year, as the development of e-commerce sparked a growth in demand for warehousing and transportation services. In contrast to the increase in M&A in the construction and transportation sectors, the traditionally popular sectors, including pharmaceuticals, medical and biotechnology, and industrials and chemicals, underperformed vis-a-vis last year, said MergerMarket. These two segments witnessed total deal value and volume falling to under half of last year. Inbound M&A activity fell for the second consecutive quarter, and was down 20.1% at $3 billion from the first quarter of last year. This year 36 inbound deals were recorded during the first three months as compared to 55 deals during the same period last year. Though overall deal value increased during the quarter, deal count fell by 43% as the country recorded 74 deals between January-March this year, showed the report. The report added that in the context of a challenging global macroeconomic environment and the slowing pace of M&A activity in Asia-Pacific compared to 2015, India still gained a 5.2% market share by deal value, a 1.9% growth over 2015.